It is clear that in today’s fast paced and economically challenged environment; the competency of personal accountability is certainly one of the top attributes a successful leader must bring to the workplace. Those who are personally accountable experience a much sweeter success whether it’s in the marketplace, community, or family. The modeling of personal accountability trickles down, and people tend to catch it through example. This results in increased customer satisfaction and loyalty. Personal accountability centers on the internal willingness to take responsibility for solutions. Accountable people solve problems without getting discouraged, even after some initial failed attempts. On the other hand, a person with poorly developed personal accountability will make excuses, project blame, and focus on what is wrong. Put simply, the difference between these levels of accountability can be framed into two categories: leader and victim. A successful leader understands it takes commitment and persistence for teams and organizations to grow and succeed. They accept responsibility for their actions even in messy or challenging circumstances. They seek long-term solutions that culminate in sustained commitment to the values and objectives of the business. Accountable leaders also view mistakes as a learning opportunity and use them as a springboard for moving forward. One of the most memorable examples of personal accountability is arguably the Johnson and Johnson case. Led by their mission and values system, J & J did not hesitate to implement a total product recall back in 1982 when it was determined their Tylenol product was being tampered with. The result was not only the innovative tamper-resistant packaging, but a growing favor from the public. A potentially disastrous situation ultimately became a marketing opportunity. Other examples include Nordstrom’s long standing tradition of accountability which includes a representative taking back a set of tires from a frustrated customer (Nordstrom does not sell tires), as well as Whole Foods’ commitment to being accountable to our world by purchasing power from wind mill farms and their unprecedented organic criterion they sustain with their products. The clear upholding of their mission and values, regardless of hurdles and obstacles, puts these companies in a category unmatched by most. People and teams flourish within organizations that consistently do the right thing. This inspires all of us to own solutions, regardless of what stands in our way. The challenge for 21st century leaders is to stay positive, be courageous, seek solutions, and learn from mistakes. Am I asking questions to find solutions (or to assess fault)? Am I committed to persistence and success, regardless of the obstacles ahead? Can I admit my mistakes and move past them? Do I create an environment where failures create learning opportunities? What can I do to help other’s generate energy to solve core issues? 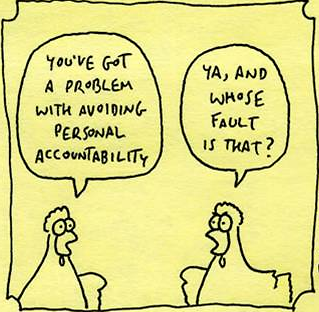 Personal accountability is critical to success in your organization, career and life! All of us seek out others who we can rely on and trust to come through for us, even though tough obstacles arise. Personal accountability boils down to doing what we said we would do – regardless of the cost. It does not mean that everything will run smoothly or even be delivered on time. Remember, it is often the most difficult trials handled well that provide the most learning and, as in the case of Johnson and Johnson, deepen levels of loyalty and trust from those we care about and serve.